For GIGABYTE providing SECURITY on a customer’s INVESTMENT in our products is a top priority, because of this we are proud to introduce our new warranty upgrade programme. 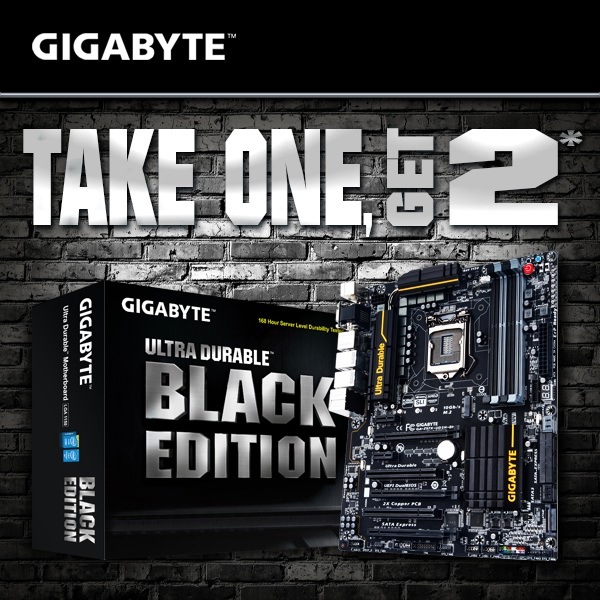 October 21th, 2014 – Today, GIGABYTE TECHNOLOGY Co. Ltd., a leading manufacturer of motherboards and graphics cards, launched its new service and quality offensive for their GIGABYTE Black Edition series motherboards, based on the latest Intel Z97 chipset. GIGABYTE has always been known to produce high quality, stable motherboard products for years. To provide their loyal customers with even more security and confidence in its products GIGABYTE has now drastically expanded their service for motherboards. All customers who purchase a new 9 series Black Edition motherboard (models listed below), tested on 168h server level benchmarks are able to register for the ultimate and unique UPGRADE WARRANTY. So what is the Ultimate Upgrade Warranty you ask? This upgrade warranty provides the customer the right to exchange their 9 Series Black Edition motherboard within three years of the purchase date for one model from a future series. If the customers prefers a GIGABYTE motherboard from a future series better or they want to use a new CPU with a different chipset base, their Black Edition motherboard may be returned within three years and they will receive free of charge a brand new next generation motherboards. Details of this UPGRADE WARRANTY are found at: http://bk.gigabyte.eu/EN_bk_UK_Ireland.html. On top of this 3 year UPGRADE WARRANTY, the GIGABYTE customers receive an extended manufacturer’s warranty of 60 months, yes 5 years when they register, so if they are happy to keep their motherboard and not upgrade its covered under a 5 year warranty. These motherboards are available in stores now so you can buy today and register for the UPGRADE WARRANTY NOW just remember you have up to 4 weeks from the purchase date to register and qualify. GIGABYTE is looking forward to supporting you and given the fast-paced nature of technology these days is hoping you will enjoy our product and service. What about X99 motherboards? Which ones qualify? Great program to bad it cant be expanded to include the gaming G1 and the SOC force both which I have...lol. But I understand limiting it to the Black Editions. Does this offer apply to boards purchased in the USA? Is their a site for US? But you may check with our US branch directly for local programmes there.